→ Next: Three Brod Bagert Titles Now Available Digitally! 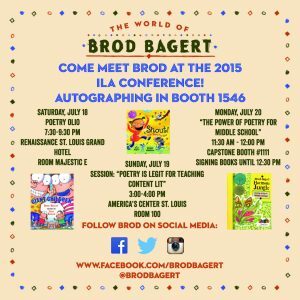 Stop by Booth 1546 during the 2015 International Literacy Association Conference in St. Louis to video Brod performing for your students and to get autographed books and posters! Additionally, Brod will be presenting both a conference session with Dr. Julie Bryant and Professor Jennifer Fox on Sunday, July 19 and at the Capstone Publishing Booth on Monday, July 20.